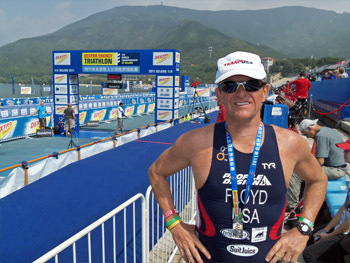 Coach Bill at the ITU World Championships in Beijing. When you are selecting a coach, there are many areas that you have to look at before choosing. Winning triathlons is an important consideration, to a point. However, winning does not necessarily mean you know how to coach, teach, advise, and to lead to victory. My background includes working in billion-dollar corporation environments that are demanding and fast paced. They push you to the limits and teach you stress levels that are world class, yet, manageable. In more than one company I had the honor and privilege to be selected as the District/Regional trainer. In fact, if it were not for a family illness, I would have been the Director of Training and Development for an extremely profitable division of a 58+ billion dollar corporation. Plus, I have had the good fortune to be promoted to District and S. E. Regional Manager in these large companies. Because of my skills and achievements, I was selected Manager of the Year. And, my degree is in Mass Communications, sequence in advertising, from the University of South Florida. So my experience gives you skills that are directed and honed to bring out the best in you. The impact you may achieve: I have coached triathletes to the U. S. National Championships, and, to the World Championships. Plus, I am Nationally and World ranked and a two time member TEAM USA. In a short synopsis, read about some of my athletic, managerial, training, and leadership backgrounds. Then you will make a stronger decision when you select me as your coach. By utilizing current written materials and gaining insight through visionary prowess, observation of the mechanical and technical skills of triathletes in motion, and high tech testing, formulation of individual plans of achievement will be instituted. Training hard will not be emphasized; training right will be. Through Periodization, the right amount of mileage/time, the right amount of exposure to the elements, the right amount of energy output, at the right time, the right amount of nutrition, and the right amount of recovery and rest, will be emphasized and coached, along with becoming more efficient. A highly technical computer program will be utilized to tweak the triathletes individual level of achievement and commitment. The individual Training Plan will be evaluated, and updated, at strategic points on the calendar to insure all slated races are tracked, and training time, skills, intensity, and duration will be formulated to meet/exceed the athlete's goals and objectives. Winter Triathlon What, When, Where and How? Training of the Elite Endurance Athlete Physiology: "Checklist Data"
USAT Certified Coaches are required to take 20 hours of continuing education units every two years for their certification, as well for USA Cycling, too. The following courses were taken by Coach Bill for his certification and re-certification. Others were taken to achieve his need for excellence in training athletes to their highest level of commitment and ability. TEAM in Training Smart Coaching: National Triathlon Coach Certification, by Dave Scott. Bill signed on with TEAM in Training, affiliated with the Leukemia-Lymphoma Society for fundraising. In Washington, D.C., Bill attended the TEAM in Training National Certification Clinic. He was trained and coached at the clinic by Dave Scott, six time winner of the Hawaiian Ironman. He brings this high level of training for coaching to all of his clients along with his USA Triathlon Certification, Level II. He has been responsible for training the triathletes for St. Anthony's International Distance Triathlon, Florida 1/2 Ironman, and the Disney World International Distance Triathlon You can check out the TEAM in Training website by clicking this logo , or go to the Sponsor/Links page and click on with that icon. Hunter Kemper, the first 3 time Olympian in triathlon,and finished 7th in the 2008 Olympic Triathlon at Beijing, with Coach Bill at a USA Triathlon Champions' weekend. We met up with Hunter again at the New York City Triathlon, and watched him train in the pool during Coach Bill's Elite Mentorship Program at the U. S. Olympic Training Center in Colorado Springs,Colorado. Formerly ranked number one in the world, and a multi-year number one at the Elite National's, besides many other wins of the highest of ranking, including the Lifestyle Fitness Triathlon. A fierce competitor and a nice guy, a rarity in today's world. As you read a few of my athletic achievements, please note that my experience in endurance competition is broad while also shown are those with a high degree of skill and agility. The reason you are given these is so you will know the quality of athleticism, and what you can expect from your coach. I have competed in triathlons since 1988. MANAGERIAL/TRAINING BACKGROUND A background in sports is vital for an on hands experience, however, to coach effectively, experience in managing and leading is the important ingredient to draw out of the athlete his best, at the right time, in the conditions given, with the attitude of accomplishing our agreed upon goals and objectives. While I can not list all of my accomplishments, these will give you the background needed to make a conscientious decision on my becoming your coach.